Welcome to Paul Braid Fine Art Ltd! 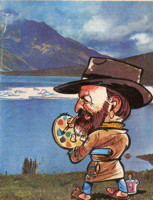 Paul Braid painted landscapes, life and portraits for over 65 years from the age of 13 to his passing in December 1999. Franklin Carmichael from Canada's famed Group of Seven was one of Paul's instructors while he studied art. Paul graduated from the Ontario College of Art in 1947 and came west in 1953. Paul did not limit his talent and painted in a variety of different styles and mediums. He taught throughout the province for the University of Alberta Faculty of Extension and pursued his art career full time until October 1999. Paul's love of history and nature are evident throughout his work. Concentrating on painting scenes of Alberta's splendour and heritage, Paul's work has captured the essence of the natural beauty that is found in Alberta's mountains and homesteads. Paul had 22 paintings on tour with the Edmonton Art Gallery's Travelling Exhibition Program (Alberta Foundation for the Arts). These paintings were on tour until 2005. Paul's work is also found in art collections, both public and private, around the world. Each picture in the gallery can be enlarged simply by clicking on it. Every painting that is posted on this website is for sale and if you are interested in finding out more information on any of the paintings, please visit our "Contact" page. Please bookmark this website and check back often as more galleries and information tidbits are coming. Copyright © Paul Braid Fine Art Ltd.